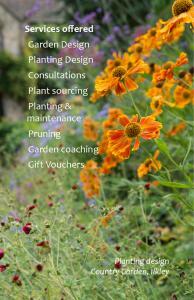 Map Garden Design, Consultations, Planning & Planting - small or large. Garden Designer & Horticulturist based in Ilkley, West Yorkshire. Areas covered include Ilkley, Harrogate, Skipton and surrounding areas. Design services range from full garden design package to border renovation. eg. Concept Plans, Detailed Plans, Planting, Sourcing. Services related to horticulture eg pruning, coaching & maintenance of designed borders. Garden Experience Gift Vouchers also available. Professional & approachable service. See website for further details. Pre Registered Member of the Society of Garden Designers. Best of HOUZZ 2016 award - Yorkshire and Humber.